There’s not a single person on this planet who hasn’t experienced a problem with his internet connection. Generally when your internet goes down, it’s either your computer or your internet service provider who is to be blamed here. Most of the time, internet connections are down for a short period of time. This is usually what happens with my ISP. So whenever my internet connection goes down, here’s a little trick I use to monitor the internet connection status on my windows PC. Using the command prompt and the ping command, the command prompt can be used as a network monitoring tool to constantly monitor your internet connection. Although the command prompt will not show the amount of data being transferred through your network, but it will let you constantly monitor your internet connection and thus let you know in real time, whether your internet connection is up or down. So here’s how you can use command prompt to constantly monitor your internet connection on windows. 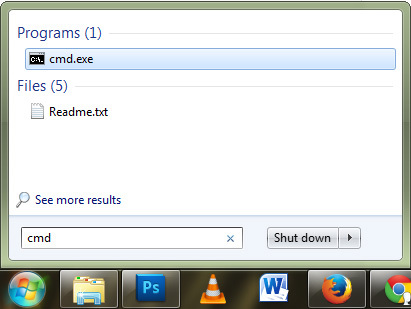 Step 1: To access command prompt in windows, click on the Start button and type in “ CMD “ in the search bar. Click on Cmd.exe to start command prompt. 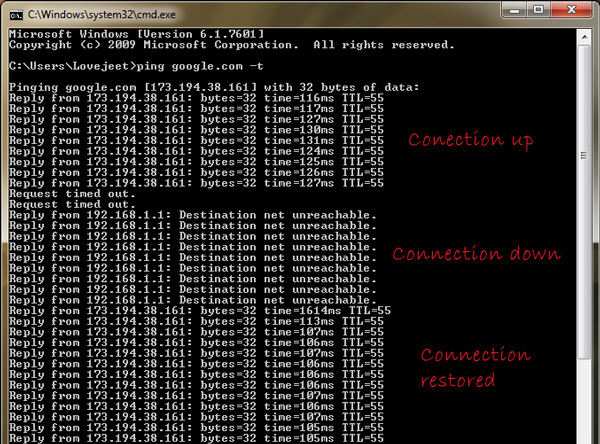 Step 2: Now type in the following command in command prompt : “ ping google.com -t “ without the quotes and press enter. You can replace Google.com with any other popular website, but google.com is preferable since it has the lowest downtime. The -t value here is very important since it will constantly repeat the ping command. Finally the command should start pinging Google.com constantly. As long as the ping command doesn’t return a Request timed out status, your internet connection is up and working fine. The screenshot above shows when an internet connection is down and when it is up.